Whether your brand is B2B or B2C, marketing to your consumer is becoming more and more difficult, fragmented, and sophisticated. Because of media fragmentation as well as the on-the-go nature of today’s consumers, it is important to leverage all mediums possible to reach your target audience, including mobile. As mobile devices become more widely adopted by the minute, brands are turning their sights to mobile media as a new delivery channel. The challenge is what type/platform of mobile media is best suited for your brands to reach your target audience and business objectives. 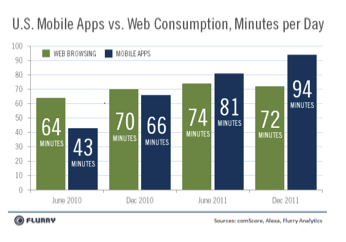 As of December 2011, mobile app consumption surpassed mobile web consumption, with 94 minutes spent per day in mobile apps compared to 72 minutes in web consumption according to a study by Flurry Analytics. The opportunity to deliver impressions at scale is almost infinite, or at least enough to cover most brands campaigns. Advertisers are using this platform more and more to engage and convert customers. Greystripe Mobile: Uses proprietary data sets such as commission junction to deliver custom audience focused campaigns. iAds : A proprietary Apple platform exclusive to iOS devices, iAds offers advertisers the ability to target audiences under specific criteria. While they have recently lowering their million-dollar cost to entry, this platform is best for a more nationally focused brand looking to reach deep into the iOS market. 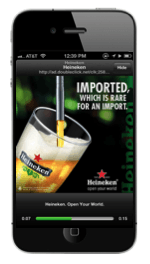 These ads offer a more engaging 300×250 ad unit that serves as an interstitial between plays in games or app navigation. It also reduces the amount of accidental clicks with its more active click platform such as Greystripe’s “find out more” or “skip” buttons. These ad units can incorporate the most engaging platforms such as TV/Radio ads with hyper target ability. While most platforms only offer ads to non-premium users, all users are logged in with a minimum amount of information available allowing for focused campaign targeting. Pandora – One of the most widely adopted streaming radio platforms, Pandora offers static banners as well as accompanying 15 and 30 second audio/video platforms. This platform offers a rich ad experience with an engaged audience. Because of the cap on the amount of advertisers per streaming session, there is less clutter from other advertisers, increasing an advertiser’s share of voice per session. This platform can be targeted geographically down to zip code, so it allows advertisers to stretch budgets far beyond that of terrestrial radio, targeting key trade areas rather than entire radio markets. If you are looking to drive brand engagement, then rich media could be the right platform. While a bit more expensive, rich media can offer advertisers completely unique brand experiences through games and even elevate your brand awareness through interstitial 15 and 30 second commercials. Greystripe and iAds offer the rich platform, both have a great gallery of ads to explore to get a great idea of the possibilities of this platform. Completely unique to each advertiser, rich media ad within the mobile space provides a great opportunity to drive engagement with new customers. While not right for all brands, consumer products such as beverage and car companies tend to leverage this platform the most. Tried and true, and one of the first advertising platforms in the mobile space, SMS is great for connecting with your most loyal customers. While this requires an initial customer acquisition strategy, once a user has opted in to your SMS pool you can deliver real-time offers, coupons and reminders to nurture your customers throughout their lifecycle. Depending on your opt-in process and selected SMS campaign management tools, messages can be segmented to customers who have indicated a certain location or trade area, gender, age, and so on. The balance of collecting relevant information but not asking for too much is important. Making it easy for customers to opt-in initially and then qualifying them through your campaign is the best way to segment audiences by interest. There are a ton of companies in the SMS game, so it is important to find the right partner that meets your campaign objectives. Things to consider are the cost per send, any associate campaign set-up or maintenance costs as well as the intuitiveness of the campaign management and monitoring tool. You must also consider the promptness of the opt-in and opt-out process. The last thing you want in an SMS campaign is to continue sends to those customers who have opted-out as well as delays for those customers who want to receive your messages. Ask your media planner for case studies of advertisers similar to your own business. Patrick Murphy is the Director of Media Services at Off Madison Ave + SpinSix. With a background in traditional media, Patrick focuses on audience insights to drive media recommendations. He has provided strategic recommendations for a variety of clients including Arizona Office of Tourism, McDonald's, Mid First Bank, Gold's Gym, and Oxford University Press.